Retired NFL lineman Geoff Schwartz previews what to watch for in Kansas City, with a trip to the Super Bowl on the line. Alright folks, time for championship weekend. I have many thoughts and I’ve waited to weigh in on the AFC Championship Game until as late as possible to gather as much info as I needed. I’m ready to go. Let’s dive in with the game in Kansas City between the Chiefs and New England Patriots. This game is a rematch of a Week 6 victory in New England that the Patriots won 43-40 on a late field goal. 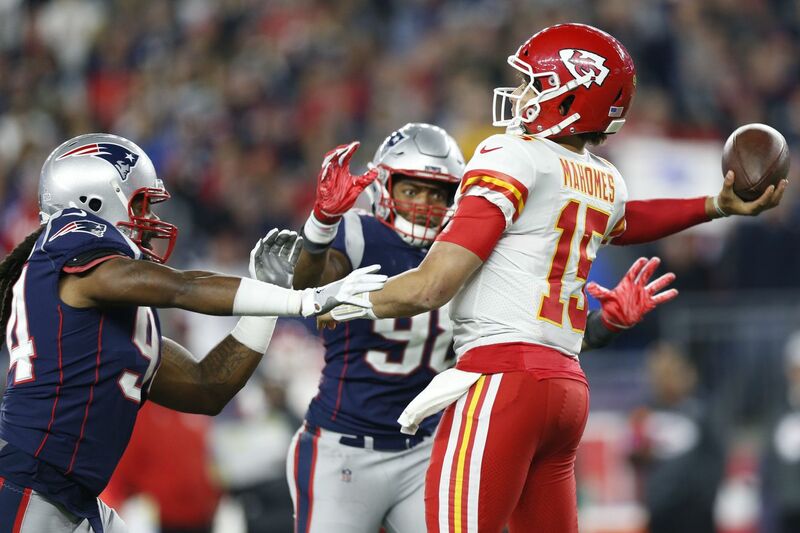 It was a back-and-forth offensive affair, with the Patriots just making more plays than the Chiefs at the end of the game. While it would be easy to assume the game this weekend might mimic that, I doubt it. Here are four things to watch for Sunday, with a trip to the Super Bowl on the line. Will the Chiefs’ homefield advantage be a factor? The Patriots are an excellent team at home. They were 9-0 and averaged 30+ points at home this season. Their defense allowed just 17 points a game in their friendly confines. On the road, the Patriots are 3-5 this season, allowing almost seven points more a game than at home. They’ve played sloppy on offense and haven’t been able to score. However, they beat the one playoff team they faced on the road: the Chicago Bears. I don’t buy this “Patriots are bad on the road in the playoffs” stuff, either. They’ve played two, yes TWO, road games in the playoffs since the 2007 season —both in Denver. That’s hardly a large sample size and with a completely different team outside of coach and quarterback. The Chiefs are similar to the Patriots. They are outstanding at home, and not so hot on the road, especially on defense. For whatever reason, the Chiefs defense is money in Kansas City. They allow almost half as many points at home and force more turnovers. They thrive on the crowd and their pass rush in Arrowhead. How do the Patriots stop the Chiefs offense? In three of the four games between the Patriots and Chiefs since 2014, the Chiefs have scored 40+ points. Two of those games were with Alex Smith under center. With both Smith and Patrick Mahomes at quarterback, the Patriots haven’t had an answer for Tyreek Hill in their last two games. He’s had 20 targets, 14 catches and 275 yards. Beyond that, Kareem Hunt torched them, both on the ground and in the air. He’s off the team, but the option of using the back on Sunday is still there. Last week against the Colts, Damien Williams rushed for 129 yards and a touchdown and caught five passes. How do the Patriots stop this offensive explosion? It’s easy enough, but they must mix up coverage against the Chiefs. The Patriots are a high-man coverage team. They typically, or in the past, have taken their best cornerback — which is Stephon Gilmore now — and put him on No. 2, and then doubled the best receiver with their second-best corner and a safety. Well, against the Chiefs, that’s easier said than done. If you decide to double Hill, then you can’t put Gilmore on the next best receiver, because that player is Travis Kelce. So that’s not happening. If the Patriots insist on playing man coverage, as I’d expect them to do, they will most likely bracket Kelce, like they did in the first game this season. If Hill is lined up in a stationary position, the Patriots must get in his grill. They can’t allow him to get free releases and run up and down the field without any contact. In fact, I’d expect the Patriots defense to be aggressive in creating contact off the line of scrimmage as much as possible. Earlier this season, we saw the Ravens go out of their way to chip Kelce if he lined up near the line. The Patriots will do that as well. The Patriots will reroute any crossers and be hands-on as much as possible. When the Patriots mix up coverage, expect zero pressure, and off the zero-pressure look, a three-man rush. The Patriots showed the zero-pressure drop into a three-man rush in their first meeting and it forced some early throws from Mahomes. The goal is getting someone to rush free and then Mahomes makes a poor decision and one of the droppers can pick the ball off. The Patriots must have a plan for Mahomes when he breaks out of the pocket. We’ve seen most of his damage done when Mahomes rolls to his right out of the pocket. The Patriots will rush and contain Mahomes as best as possible, possibly even having a spy to not allow Mahomes to make those extra plays. When Mahomes does leave the pocket, he’s not doing so to run. He’s looking to pass, but defenses often key on Mahomes running and he throws the ball into the areas where the defenders aren’t anymore, creating big plays for the offense. Whatever the Pats do, they must be multiple and not show the same coverage over and over. One thing that will help the defense is their offense. The game plan is always the same against the Chiefs: Run the football against their poor rushing defense and play keep-away from Mahomes. However, when the Chiefs start scoring points and build up their lead, the Patriots must stick to the game plan, like the Chargers did. Will they panic and move off the plan? If they do, this game is done. Both teams usually like to defer if they win the toss. Like last weekend, I expect the Pats to take the ball first if they win the toss. There’s no better way to control the tempo of the game by coming out fast and taking control.